The largest shopping center on Maui, Queen Kaahumanu Shopping Center, might fit into the average sized IKEA. It’s not that big. One can easily walk through it in a half hour, which makes finding stores pretty easy. Since Hawaii real estate is so expensive, each store has to make a serious profit to survive. Even Ben and Jerry’s Ice Cream struggled on Maui. The mall might not be the most interesting place on Maui, but it’s air-conditioned – a boon during last summer’s unexpected heat wave – and shady under overhead “winged tarps.” Plus it has one of the few movie theaters on Maui. Winged ceiling of the two story mall. Children's (or keiki) hula at Queen K Center. 1. Camellia Imports, a crack seed store – Jars upon jars of shrunken plums and other shriveled, preserved and seasoned fruit, seeds, and lemon peels. The concoctions may be an acquired taste (and can look frightening), but “crack seed” is wildly popular in Hawaii, especially the punchy li hing mui flavor. 2. Ben Franklin’s Craft Store has sundries like lei needles, oodles of “eyelash” yarn for yarn leis, supplies for making paper clay flowers (to wear in one’s hair) and other popular local style crafts. 3. Local Motion for surf apparel: rashguards, board shorts, and waterproof cases to keep your (battery powered) keys dry. 4. 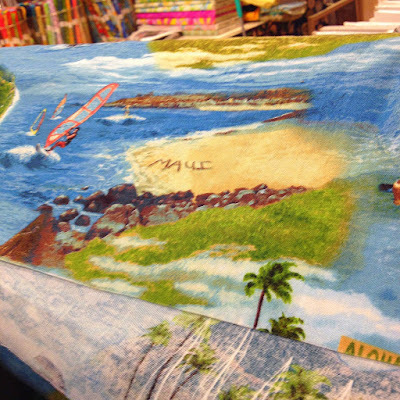 Sew Special has designs and fabric for Hawaiian quilting and other Hawaiian fabric arts. Jars of mysterious local confections called "crack seed" at Camellia Imports. "Maui" fabric available at Sew Special, with windsurfers at Hookipa Beach. The Maui Friends of the Library (MFOL) bookstore has a good selection of new and used books on Hawaii and Maui, in addition to the selection of used books. Farmers Market on Tuesdays, Wednesdays and Fridays selling vegetables, fruits, orchids, Hawaiian tapa or kapa (printed barkcloth), and some Filipino sweets and pastries. I don’t know of other major shopping centers with farmers markets, do you? The Story of Hawaii Museum has artifacts, reproductions and a lot of maps from different time periods. Free hula shows and Polynesian crafting workshops on Tuesdays. The Maui Music Conservatory offers lessons and the occasional free concert. View of the Queen K Farmers Market from the top floor. The mall is named after Queen Kaahumanu, the favorite wife of King Kamehameha I, who united the Hawaiian Islands. She was also considered a fair and beloved ruler. Apparently, she was also born on Maui in Hana and her birthplace can be visited, with a bit of luck and determination. Kaahumanu is pronounced, "Ka-ah-who-mah-new."